The buildup of plaque in the carotid artery can reduce the flow of oxygen-rich blood from the heart to the brain. 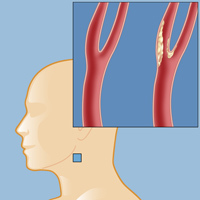 A healthy carotid artery is shown at left; an artery narrowed by plaque is at right. Carotid occlusive disease, also called carotid stenosis, is a condition in which one or both of the carotid arteries becomes narrowed or blocked. It is a serious condition that increases the risk of stroke if left untreated. The carotid arteries are located on either side of the neck — you can feel your pulse quite strongly there by pressing your fingers against your neck below your jaw, to the side of your voice box. Just above the pulse point, the carotid artery branches into two smaller vessels, called the internal and external carotid arteries. Healthy, unobstructed carotid arteries are the critical pathways that supply freshly oxygenated blood from the heart to the brain. When those arteries become narrowed or blocked by plaque, not enough oxygen gets to the brain. The plaque may also break off into small pieces (emboli) that can travel into smaller vessels in the brain and lead to stroke. The area where the main carotid artery branches is a common location for a blockage. If an artery becomes completely blocked (which is called carotid occlusion) or if piece of the blockage breaks off and travels to a smaller vessel where it completely blocks blood flow, a part of the brain may be completely deprived of oxygen, leading to the destruction of brain tissue. This is what happens during the event we call a stroke, or a “brain attack.” There are nearly half a million strokes each year in the United States, and it’s the third leading cause of death. Stroke claims 140,000 American lives a year — and half of those fatal strokes can be traced to carotid occlusion. What Causes Carotid Occlusive Disease? The usual culprit in the narrowing of the carotid arteries is the buildup of atherosclerotic plaque, which is made up of fatty material and blood platelets, along the walls of the blood vessel. That buildup can damage the artery walls, which then narrow and harden. A piece of the fatty deposit may also break off and travel to a smaller artery in the brain, causing a blockage (the breakaway blockage is called an embolus). Contributing factors for plaque buildup include high cholesterol, high blood pressure, diabetes, smoking, and obesity. Carotid occlusive disease also has a family component, so having a family history of stroke increases your own risk. Find out more about the Stroke Program at the Weill Cornell Brain and Spine Center, or use our online form to request an appointment. Reviewed by Y. Pierre Gobin, M.D.